We awoke in the AM having slept quite well although we did feel the effects of the Diamox. We all were up three times last night. During the night the sky had been clear and the stars were "stupendous" to quote my journal. We got up at 6:30 and when we looked outside the sun was rising and we were above the clouds. It was a gorgeous sunrise as the photo shows. At breakfast the occupants of one of the huts were complaining that they had slept terribly as there was a troop of monkeys on the roof of their hut all night. I am not sure what kind of monkeys these would have been. Breakfast was quite good actually with a thin gruel of porridge, toast and scrambled eggs. We were on the trail by 8:30 am. 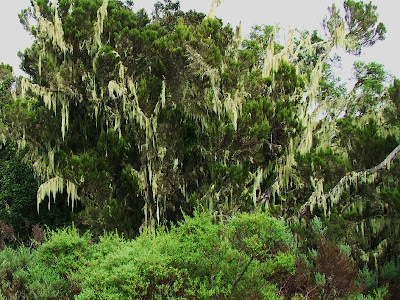 We were above the forest, in the moorlands with some scubby trees festooned with an Usneoides type of lichen. The mist would roll in and out and we were constantly putting on and taking off layers. However the scenery now that we were out of the forest was spectacular. You begin to get a sense of scale, and realize how truly massive this mountain is! Behind us we could see cinder cones lower down the mountain. There were deep canyons where the meltwaters had carved into the volcanic rocks. We were hearing birdsong a lot today but the culprits were hard to see. The only bird that I could identify were Malachite sunbirds. I saw quite a few of them. We also saw numerous skink like lizards, and one small gerbil like rodent. 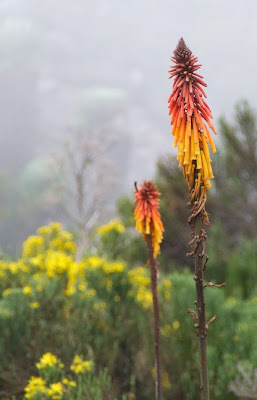 Botanically, it was a very interesting day as not only were there a lot of flowers, we saw our first giant groundsels and giant lobelia, two endemics to the mountain. There will be more posts on the flora. It would be a fantastic trip for botanists, even if they just climbed to Kibo. Eventually we came to the Horombo huts. It seemed quite the little settlement with the huts, washrooms, dining hall, 'office and admin' buildings and a tent city as well. Some climbs that go up to the summit on one route use the Marangu route on the way down, camping at Horombo after summitting. The whole collection sits on a large point and the view in all directions is fantastic. 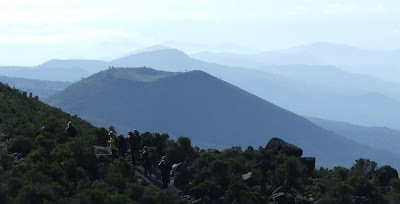 Here we can see Kibo peak as well as Mawenzi peak. As well we can look down for what must be a hundred miles.